For future business/investment analysts, financial analysts and research analysts. InVhestia is bridging the gap between theory and practical by educating university students on what is required of them in the current job market. Being a corporate and project finance advisory firm, we believe that graduates ought to know the latest trends in the market that will give them an edge as they look to fit into the job market. 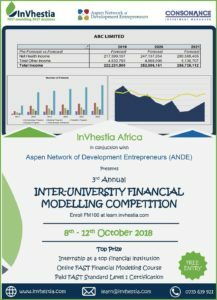 For this reason, InVhestia will in October be launching the third inter-university FAST Standard Modelling Competition! The purpose of this competition is to sensitize future (and current) business/investment analysts, financial analysts and research analysts not only how to model but how to do so while meeting the international standard. To learn more about the FAST Standard visit the About InVhestia page. The competition will be launched online at 9:00 AM on Monday, October 8th, 2018 and run for 5 business days to close on Friday, October 12th, 2018 at 11:59 PM. This will give students ample time to take our free introductory course to financial modelling and then tackle the case study that we will share. We promise to go easy on you! All competing modellers will receive a certificate of participation.